Have you ever been sitting around wondering what to do with yourself, and the only answer you can come up with is to eat a bag of chips? There are some days when my mind starts thinking of snack foods and I just can’t kick the craving. So every once in a while, I do it; I fill up a big bowl of chips and I devour them—and I’m as happy as can be. This is especially true as the days get shorter and the nights get longer. But the truth is that if I ate chips as often as I craved them, I’d be increasing my risk for heart disease, obesity, and type 2 diabetes immensely! Sure, it’s okay to eat them sometimes, but making a habit of it can be deadly. Potato Chips by the Numbers: What’s Really in One Serving? One serving of Lay’s salt and vinegar chips—my favorite brand—is 270 calories, but one serving is only 27 chips. That’s not even a quarter of a bag. If you can have a bag of chips beside you and only eat a small portion of it equal to one serving, well, I definitely envy you. For me, the company’s motto—Betcha can’t eat just one—is pretty spot on. A half-bag, which can disappear quickly, may be more realistic, so my craving one night may very well rack up 540 calories, 34 grams of fat, 52 grams of carbohydrates, and 900 mg of sodium. So clearly chips aren’t the best option for munching on, but what is? One of my favorite snacks to substitute chips with is popcorn and seasoning. Air-popped popcorn is actually a rather healthy snack. It’s low-calorie, tasty, crunchy, filling, and has a lot of fiber—fiber that can help lower cholesterol and decrease the risk of heart disease. Fifty grams of un-popped popcorn contains about 190 calories. It’s got a little over two grams of fat and more than seven grams of fiber. But most importantly, 50 grams of un-popped popcorn turns into about six cups of air-popped popcorn, which is probably enough for you and a friend! And instead of adding butter, you can add various seasonings—or even your own salt and vinegar—to boost the flavor without piling on any more oils, calories, or other dangerous ingredients found in most potato chips. 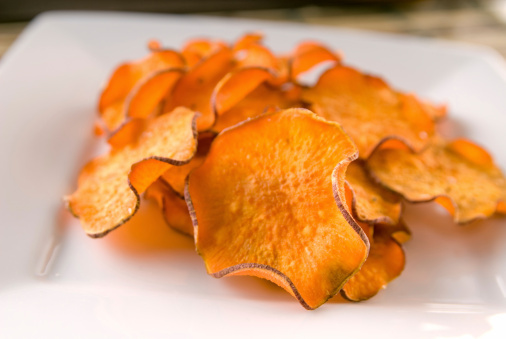 I’ve also made my own sweet potato chips, and they’re delicious. Just make sure you make a bunch at once and store them for when the cravings hit. This healthy snack is loaded with vitamin A and is low in calories. You can add garlic to increase the flavor and health value, too. What’s the recipe? Simply slice up a couple of sweet potatoes, apply a quick brush of olive oil, and top with minced garlic and rosemary (or any other favorite spices). Bake them in the oven at 400 degrees Fahrenheit until crispy (about 20 to 25 minutes), and there you have it—a healthy, delicious homemade snack! Cravings aren’t going anywhere, so management is essential. Go ahead and eat some chips every once in a while, but substitute with healthier options like popcorn and sweet potato chips to satisfy your cravings and boost your overall health!